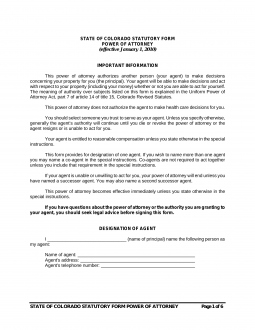 Colorado Power of Attorney Forms convey legal authority to a trusted person expected to act on behalf of an individual during that individual’s absence. These types of forms can be used in a broad range of circumstances, including in a temporary situation where an individual will be out of town for a short period of time or in a long-term situation where an individual wants to protect him or herself in the event he or she becomes incapacitated. Because the person entrusted with the power will be able to take action on someone else’s behalf, it is important the individual granting the power trusts the person implicitly. Durable Power of Attorney – This document allows a person to designate a friend or relative to take control of their financial matters in the event of some sort of incapacity or illness. General Power of Attorney – This allows an individual to grant an agent the power to make financial decisions on behalf of the principal, however, it becomes void if the principal is deemed incompetent. Limited Power of Attorney – This form allows a person to specify with particularity limited powers for an agent to take action on their behalf. Medical Durable Power of Attorney – This form allows someone to choose a person who can make healthcare decisions for them. Signing Requirements (§ 15-14-506): Must be signed by Principal. Although not required by law, it is recommended that the signature be witnessed and notarized. Parental (Minor Children) Power of Attorney – A parent can use this form to appoint someone to be in charge of their children and make decisions on the children’s behalf if the parent is going to be unavailable. Real Estate Power of Attorney – To be used by a party that is interested in having someone else sell real property on their behalf. The individual selected has a fiduciary duty to represent the seller’s best interests. Revocation of Power of Attorney – This form can be used to revoke any power of attorney previously executed, as long as the principal is competent. Tax Power of Attorney (DR 0145) – This form allows an individual to appoint an accountant or tax attorney to handle issues for them in front of the tax authorities. Vehicle Power of Attorney – A person can use this form to appoint another person to handle issues involving the titling and registration of their vehicle.